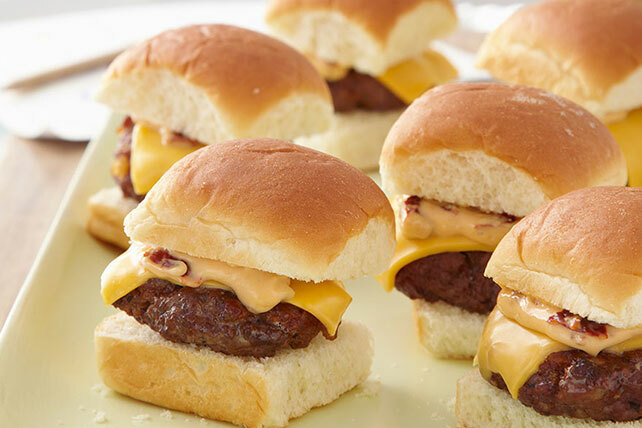 Mayo with chopped chipotle peppers and ground beef mixed with Mexican chorizo give these mini cheeseburgers a not-so-mini spicy kick! Mix ground beef and chorizo; shape into 12 (3-inch) patties. Grill 4 min. on each side or until done (160ºF), topping with Singles for the last minute. Meanwhile, mix mayo and peppers. Fill rolls with burgers and mayo mixture. Omit chipotle peppers. Prepare using KRAFT Mayo Chipotle Flavored Reduced Fat Mayonnaise. Cook patties in large skillet on medium heat 7 to 9 min. on each side or until done (160ºF). Top with Singles; cover. Cook 1 min. or until Singles are melted.